1. Give campaigns clear start and end dates. “I live and die by campaigns,” Alex said, of how he keeps his inside sales team productive. For example, he’ll run a three-week campaign around Dreamforce follow-ups, or around outbound calls to a select group of prospects. And that “three-week” part is critical. Alex made the point that if you don’t have a defined start and end date, you have no way to measure a campaign’s success. “We try to prioritize for our sales reps what’s important,” Patrick said of using the Console, which Salesforce calls a tool for productivity. His business has seen double-digit growth every month since it launched an inside sales team, and Salesforce’s Console is a huge part of keeping that team organized. “I hope you write these names down,” Alex said. “Steve Richard, Trish Bertuzzi, Ken Krogue…these are the people I looked into when I was starting my sales development.” Alex credits learning from these thought leaders for being a huge part of what took him from inside sales rep to inside sales leader. 4. Take a “why you, why now” approach to pitching. 5. Rely on Salesforce technology for better sales performance. 6. …but don’t try to automate everything. What do you think? Have you tried any of these tips, or do you have one to add? Let us know in the comments below! 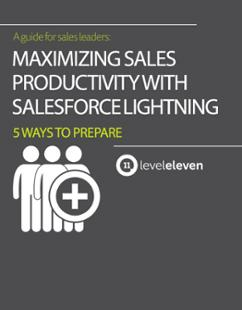 Get our new guide for sales leaders on Salesforce Lightning!